To start the story, I have to say that the Northern Cross Island Highway is really a stunning road. 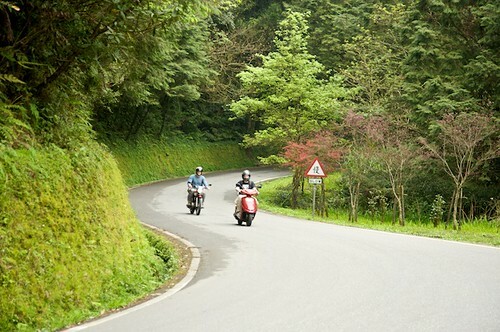 Taiwan has several “Cross Island Highways” that crisscross the Island. 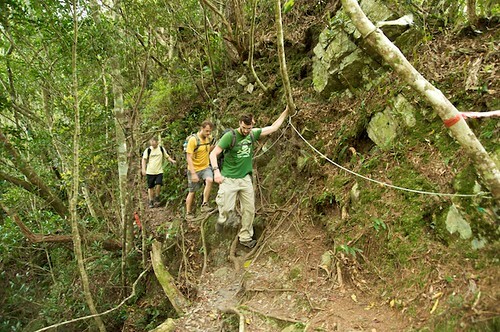 They run through some of the most remote and unspoiled places that Taiwan has to offer. I’ve already written a quick blog about a trip I took on the Southern and Central Cross Island Highways and hope to cover them in more depth this summer. I also hope to do a more in-depth blog to the Northern Cross Island Highway, but this is all you’re getting for now! It’s about a three hour drive from Taipei to Siling. Take route 7 (七號公路) south from Sanshia 三峽. It doesn’t take too long for the road to get nice and the city traffic to feel a long way behind you. 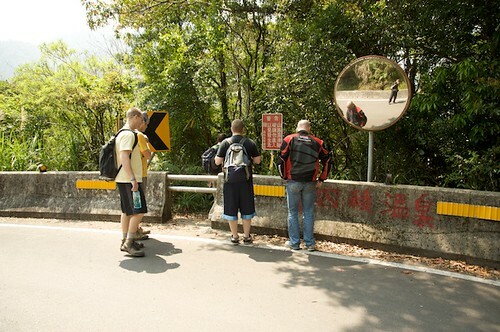 My favorite part of the road starts just after the big bridge in Fuxing 復興 and ends about 3 hours later in Yilan 宜蘭! The best entrance to the trail is the one before the sharp turn. If that big red spray painted sign wasn't enough, look for this one, then jump over it. And head down the trail. 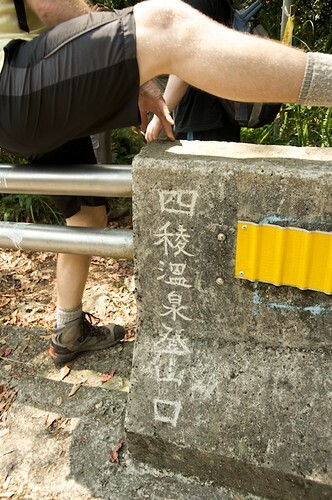 There are a few obvious signs indicating the way to the hot springs. There are a few turns going down the hill, but basically stay straight on the main trail and follow the hiking flags in the trees if you’re unsure which way to turn. 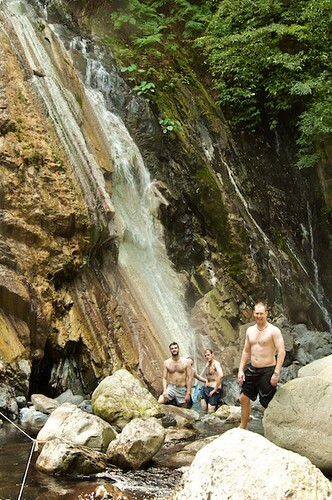 It takes about 45 min to get to the river and hot springs. 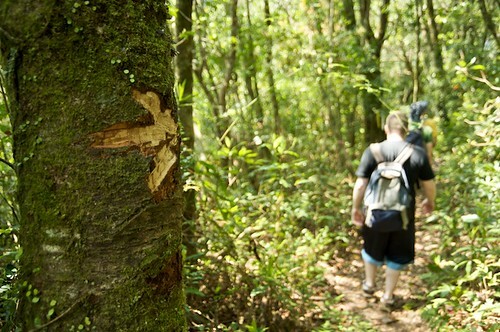 Like most hikes in Taiwan, this one had its perils. The hot spring is on the far side of the river when you get down to it. The beautiful white hot spring waterfall is pretty unique. The hairy, half naked foreigners aren't. The water is crystal clear and the temperature can even be adjusted by moving some PVC pipes around. Only about 4 people can fit in the hot water at a time. About four people can fit into the Siling Hot Spring at a time but there are additional "tubs" with lukewarm water around the main one. 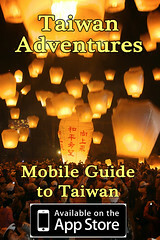 As usual, check out Stu’s site “Hiking Taiwan” for a map and some proper practicalities. Looks like quite an adventure to get there. It’s not that bad if you’re used to riding a bit. 3 hours or riding each way, (It doesn’t matter if you go back the way you came on 7 or keep going all the way around to Yilan and back on 9). And about a 45 min hike… good times!!! Cool shots and very nice way to spend some random weekend. 嘎拉賀 wild hot spring is near 四稜. 梵梵 wild hot spring is in 宜蘭 大同….. These 2 places are easier to get then 四稜. But still good! 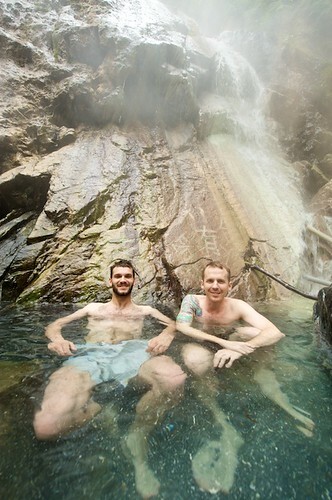 I love the wild hot springs too! I think I’ve been to 梵梵, is that the one in the river? The “mud hot springs” sound good too! I’ll have to look into them!